A Somali man used Brazil as a staging ground to smuggle people, including members of a terrorist group into the United States, witnesses are expected to testify during a sentencing hearing Thursday in San Antonio. Ahmed Mohammed Dhakane pleaded guilty in November to two counts of making false statements on his 2008 asylum application. He failed to disclose his terrorist affiliations and that he had acted as an alien smuggler. The U.S. didn't charge Dhakane with smuggling or terrorism counts, but prosecutors are hoping that testimony will convince the court that a terrorism enhancement, combined with several others, should be applied to Dhakane's sentence to give him the maximum sentence of 20 years in prison. Defense attorneys say the government argument is baseless, and that Dhakane's sentencing range falls between eight and 14 months. 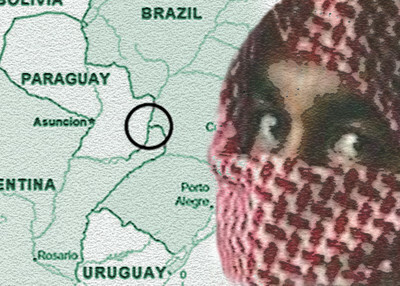 Regardless of how much time Dhakane receives, the testimony should offer a glimpse into the depth of Islamist terrorist activity in South America and how, in some cases, terrorist operatives try to make it to America via its southern border. A sentencing memo notes that Dhakane put up some of his clients in a hotel in São Paulo, Brazil's largest city, which lies near the country's southern coastline. Not far to São Paulo's west lies the Tri-Border Area (TBA), where Argentina, Brazil and Paraguay meet. The TBA has long been identified as a hub of terrorist activity, especially for the Iranian-backed Hizballah. Dhakane's case reinforces concerns that criminal activity linked to terrorism might be spreading outside of the TBA, particularly to São Paulo. A 2008 Brazilian embassy cable noted officials' concern over "several suspected Sunni extremists and some individuals linked to Hizballah – in São Paulo and other areas of southern Brazil." The State Department's 2009 Country Reports on Terrorism also pointed to the city as an area where Brazilian officials have "focused their efforts" to counter terrorists. Even Chile has seen "a radical fundamentalist presence" established in the northern city of Iquique "and to a lesser degree in Santiago," according to a cable from then-U.S. Ambassador to Chile Craig Kelly that was released by Wikileaks. A separate 2006 cable identified a possible terrorist financing link between Iquique and the TBA. In 2001, then-State Department Coordinator for Counterterrorism Francis X. Taylor described the TBA as having "the longstanding presence of Islamic extremist organizations, primarily Hizballah, and, to a lesser extent, the Sunni extremist groups, such as the [Egyptian] al-Gama'a al-Islamiyya and Hamas." Prosecutors say Dhakane's smuggling ring brought members of another terrorist group through South America. Dhakane was aware that some of his clients were affiliated with Al-Ittihad Al-Islami (AIAI), a militant group which aims to establish as Islamic regime in Somalia. AIAI was named a Specially Designated Global Terrorist (SDGT) on September 23, 2001. Dhakane ran his smuggling operation years after the designation, from June 2006, until his entry into the U.S. in March 2008. Prosecutors say he also was a member of the group, which he saw as being part of one entity with the Council of Islamic Courts (CIC) and al-Shabaab, the militant Somali group which has recently stepped up its battle against the Somali Transitional Federal Government (TFG) and the African Union Mission to Somalia (AMISOM) forces. Dhakane didn't know his clients' exact reasons for wanting to come to the United States, he told a confidential informant. He did, however, believe that "they would fight against the US if the jihad moved from overseas locations to the US mainland," the sentencing memo detailed. Defense attorneys say that statement is far too vague to prove their client intended to facilitate terrorist crimes. "Three years after Dhakane turned himself in, the Government can point to no terrorism-related plot. There isn't one, and there never was," they wrote in a memorandum to the court. "The Government can only speculate that maybe the Somalis whom Dhakane supposedly helped get to the United States might still be AIAI members who, if called upon, might answer, and who, if they answered, might be persuaded to do some unspecified something." Though some Islamists have moved elsewhere, U.S. and foreign officials continue to confirm the presence of terrorism supporting activity in the TBA and adjacent countries. Earlier this month, Veja, a Brazilian magazine, noted that at least 20 Hizballah, Hamas and al-Qaida operatives are hiding out in Brazil. Citing Brazilian law enforcement authorities, the magazine said that the operatives have been raising money and working to incite attacks outside the country. Recently, the United States acted against two individuals linked to terrorism in the TBA. In February, U.S. Immigration and Customs Enforcement (ICE) charged Moussa Ali Hamdan, a dual citizen of the U.S. and Lebanon, for conspiring to provide material support to Hizballah. Hamdan was extradited to the United States after Paraguyan authorities arrested him in the TBA in June 2010. A CRS report released around the time Hamdan was charged noted that Hizballah receives over $10 million per year from criminal activities in the TBA. The Treasury Department designated Bilal Mohsen Wehbe in December. As Hizballah's representative in the region, the government said Wehbe has "overseen Hizballah's counterintelligence activity in the Tri-Border Area (TBA) of Argentina, Brazil and Paraguay" and has "been involved in transferring funds collected in Brazil to Hizballah in Lebanon." Lax counterterrorism stances augment the threat coming from the region. Several WikiLeaks documents dated between 2005 and 2009 revealed Brazil's reluctance to cooperate with the U.S. in the war against terror, including refusing to label groups like Hamas and Hizballah as terrorist organizations. In a 2009 report, the United States described Brazil as being somewhat cooperative with the United States in tracking down terrorists, but said that its ability to stop terrorism is "undermined by the [Brazilian] government's failure to strengthen its legal counterterrorism framework significantly." Likewise, that same report criticized Paraguay's "absence of counterterrorist financing legislation," which continues to "hamper the country's counterterrorism efforts." Dhakane's story should give the U.S. one more reason for concern. He was able to operate his human trafficking operation out of Brazil for almost two years by bribing Brazilian immigration officials, prosecutors say. That operation brought potentially dangerous jihadists into the United States. But Brazilian authorities say they were not alerted to the smuggling ring, the Brazilian journal Folha reported. Speaking on condition of anonymity, two Brazilian delegates said that if they had been alerted by U.S. authorities, they could have dismantled the network. Three of Ahmed Mohammed Dhakane's smuggling clients are expected to testify Thursday in San Antonio. Additionally, FBI Special Agent Mark Wagoner will detail the history of AIAI, and FBI Supervisory Special Agent Timothy McCants will testify about the history of al-Barrakat, another designated terrorist group to which Dhakane belonged. Also expected to testify are a confidential human source with whom Dhakane talked about his terrorist associations, and an underage smuggling client whom Dhakane repeatedly raped and impregnated, before claiming on his asylum application that she was his wife whom he had married in Mogadishu. Dhakane thought that having a pregnant wife would increase his chances of receiving asylum, prosecutors say. Thank God for Steven Emerson and the entire IPT crew. Can't wait for the next book. The article isExcellent. Very informative.